85. Despite overall improvement and convergence, the efficiency of utilities in most countries is below international standards. The performance of utilities in the first wave of EU members (the Czech Republic, Hungary, Slovakia, and Slovenia) was only modestly lower than international standards at the time of their accession and largely reached them in the meantime. However, the performance of utilities in the rest of the countries still lags significantly behind such practices despite marked improvements on some of the typical key performance indicators used to measure good practices, such as nonrevenue water levels and staffing efficiency. Overall, the region’s utilities are on a positive trend toward better efficiency, but one that is also marked by significant differences among and within countries. Nonrevenue water is a measure of the ability of utility companies to turn their primary material into revenue. NRW consists mainly of water leaking from the system before it reaches the end consumer (technical or physical losses), and of water consumed without being properly billed, for example, through illegal connections or improper metering of consumption (commercial or apparent losses). While the former unnecessarily increases production costs (because more water than necessary must be produced), the latter means foregone revenues. Nonrevenue water is normally estimated based on the establishment of a balance of water inflows and outflows in the system. In 2000, the International Water Association task forces on water losses and performance indicators produced an international “best practice” standard approach for water balance calculation (see, for example, Farley and Trow 2003). 86. Nonrevenue water (NRW) has been and continues to be a significant challenge. Although the structure of NRW in the region is not well defined because of the lack of proper metering and water balancing in most utilities (see box), overall NRW generally stands much above good practice levels, with the exception of countries in the western part of the watershed (Figure 38). While NRW should not necessarily be minimized at all costs (there is an economically efficient level of NRW, which depends on the cost of further reducing NRW and on the opportunity cost of water produced and billed), current levels are much above those of even similar utilities and levels of development in other regions. Furthermore, a review of the evolution of NRW over the last 10 years shows no clear regional trend, with utilities in Bulgaria and FYR Macedonia showing increases in NRW, Bosnia and Herzegovina, Moldova, and Romania showing decreases, and most other countries remaining stable at a high level. Some of the data heterogeneity is likely to derive from better measurement of NRW today than 15 years ago because of the widespread adoption of systematic metering on the production and distribution side. 87. Energy efficiency is an important but less researched issue in the region, as well. Although regional information is not systematically available, evidence from a limited sample of utilities appears to show that energy costs per cubic meter produced have been increasing in recent years (Figure 39), pointing to the need to focus further on energy efficiency measures. In fact, a review done in the context of the Danube Water Program of more than 30 treatment plants, pumping stations, and hydraulic systems in utility companies in Bosnia and Herzegovina, Montenegro, Romania, Serbia, and Ukraine demonstrated a potential for energy savings averaging 35 percent, with values higher in countries with a legacy of limited investments in maintenance, such as Ukraine (50 percent). Most of the investments needed to materialize those energy-saving potentials would have payback periods of only two to three years, but financing for such efforts is not easily accessible. 88. Utilities in the region are commonly staffed at levels above regional good practices. Overstaffing is a traditional issue of many locally owned public utility companies in the region. Trends in the region show, however, steady improvements in staff productivity (Figure 40), especially in those countries where initial staffing levels were significantly above international practices. However, in a number of countries the levels of staffing per 1,000 people served are still above international good practices of 1 employee per 1,000 people served, even though the range of services provided is often lower than elsewhere (limited sewer coverage and wastewater treatment). 89. The commercial efficiency of utility companies is generally solid, but varies widely throughout the region. The collection ratio, that is, the ability of a utility company to collect billed revenue from its customer base, is often used as an important proxy for sound commercial practices. 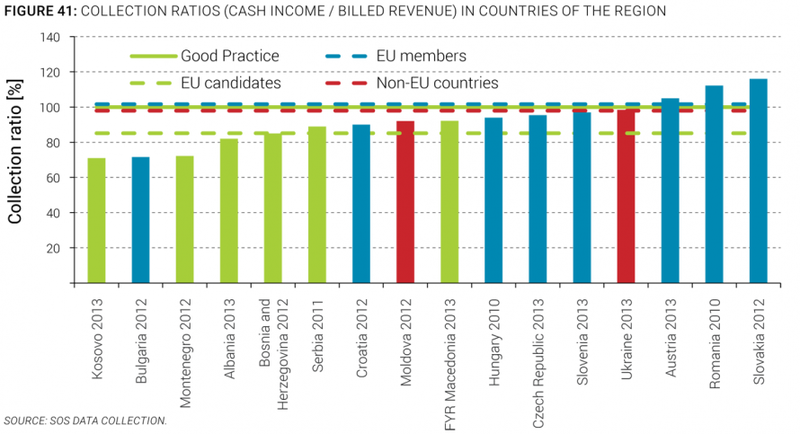 The region’s performance in this respect is solid, with the average collection ratio of many countries above 90 percent, but with some important exceptions in Bulgaria, Kosovo, and Montenegro, for example (Figure 41). Payment morale in countries in the western part of the watershed is particularly high, as it is for countries of the Former Soviet Union. 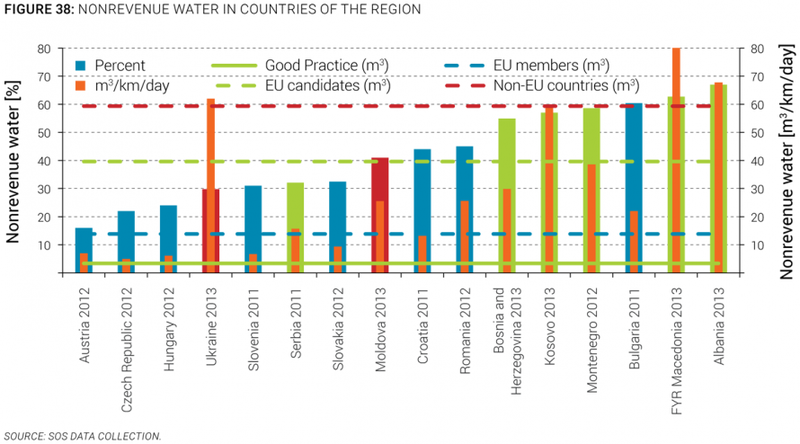 Collection rates in countries in the central and southern part of the watershed are lower.